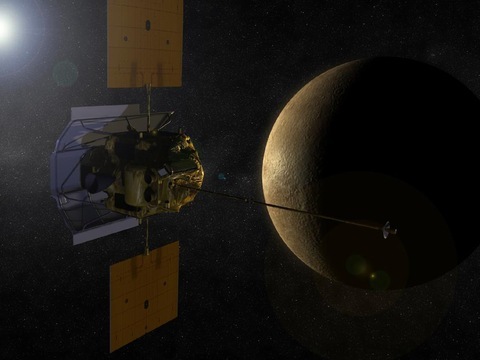 After its nearly seven-year voyage, NASA’s Messenger space capsule is expected to pull into orbit around our smaller, denser sister planet, Mercury, at 8:54 pm EST on Thursday. Once there, it will spend a year collecting data on the planet’s geology, atmosphere and magnetic field. Science Correspondent Miles O’Brien reports on the mission on Wednesday’s NewsHour. With so much in space to explore, why Mercury? Mercury’s orbit gets as close as 29 million miles from the sun, compared to the earth’s 93 million mile orbit. Translation: it’s scalding hot there. Miles details the mylar and ceramic material designed to shield the spacecraft from the planet’s temperatures, which peak at 840 degrees Fahrenheit. “On this side, it can be in excess of 650 degrees,” he says. “Just on the other side of it: room temperature. Also in the interview: other space missions ranking high on the wish list, including the search for microscopic Martians, and a subsurface ocean believed to exist on Jupiter’s icy moon, Europa. And, Miles thinks up a possible business venture while describing Messenger’s mylar shield, created with the same material used for blankets on the space shuttle. Spacecraft-inspired oven mitts anyone? Stay tuned for those, and for Wednesday’s science report on the planet closest to the sun. For more, watch excerpts from Miles’ interview with Steven Squyres of Cornell University, a Mars expert and chair of the commission that produced the Planetary Science Decadal Survey, released earlier this month.